Though she may not think herself completely ready for the role of being queen, life moves on and there's an entire kingdom waiting for her to order around. However, her destiny isn't ready to let her go just yet. And this time, there's more at stake. This time around, she travels far with friends and strangers in search of her Godstone's main power source in hopes of it helping save her crumbling kingdom. Except, destiny has its own idea as to what Elisa should do. I wasn't all that crazy about The Girl of Fire and Thorns. I loved all the adventure included in it and all of the action. It was awesome. Many things happened and I was glued to the book. However, I wasn't all too thrilled with the religious aspect of it. But religious aspect aside, I thought the book was pretty cool. And there was a lot of death. Maybe I should have reread TGoFT because for some strange reason, I could barely remember a single thing about it other than the Invernos and animagi and Humberto dying. (I was devastated when he bit the dirt.) 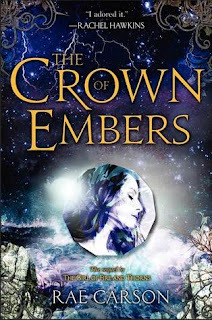 I'm usually good at remembering the names of the people and everything, but when I first opened up The Crown of Embers, I was stumped. Big time. However, I might add that I enjoyed the sequel much more than first. Elisa is one character I really admired. Her kidnapping in the first book really changed her into a strong and keen. She was observant and very smart. Elisa was totally badass and I loved getting into her mind again in this book. Fantasy will always be one of my favorite genres in fiction. It is made of awesome and sparkles. They're the epics to the Greeks in my mind. The Crown of Embers is full of deadly adventure, sweet and teasing romance, and unsolved mystery. It was gripping and magical, everything and more I could have wanted from Carson's writing. The writing itself was beautiful and poetic with enchanting imagery. To sum everything up, I immensely enjoyed this book. I really want to read that series. I also always forget almost everything about a book when it's been so long O_O And I hate re-reading so I just hope I don't get too lost haha. I'M glad this sequel was even better than the first, though I love it when that happens! Great review!